"Today on my way to work two girls came to walk with me and held my hand. They spoke even less English than my few words of Hausa but smiled warmly as we walked giggling along the dusty dirt packed road." If you can relate to the feeling of being claustrophobic in your own home, compound living takes those feelings to a new level. Here in Jahun, our compound is divided into three structures. I’ve been told that a prominent man in Jahun originally built the compound to house his three wives. Apparently wife number one did not appreciate living so close to the other wives and refused to move in. Hence the property went up for rent and here we are. All sixteen (and up to twenty) of us on the MSF team. The structures are simple. The beige paint is chipping away to reveal the gray cement. We mostly have our own rooms with shared bathrooms. Narrow cement corridors connect the buildings, while sturdy eight-foot walls a foot wide topped with spikes and barbed wire surround us. We can hear the sounds of the children attending the Koranic school next door, but we can only see the gray dusty hue of the sky above the compound walls. Exotic trees scattered throughout the compound add some life, as do the hundreds of brightly coloured lizards that run fearlessly about, always on the hunt for a fallen crumb. There is a TV room, a dining area, a small work out room and tukol (thatched roof structure with a fan that we often retreat under). Oh, and of course, the beach. Or at least, a sandy area with a badminton net. I’ve come to love our nightly badminton tournaments. Up until just a few months ago, security restrictions were so tight that all movements outside the compound had to be by car. These have relaxed a bit and we are now able to walk alone during daylight hours to the hospital, a mere 750 meters away. I really look forward to these walks. Although I take the paths and road everyday (the only option) and the scenery doesn’t change, the people do. 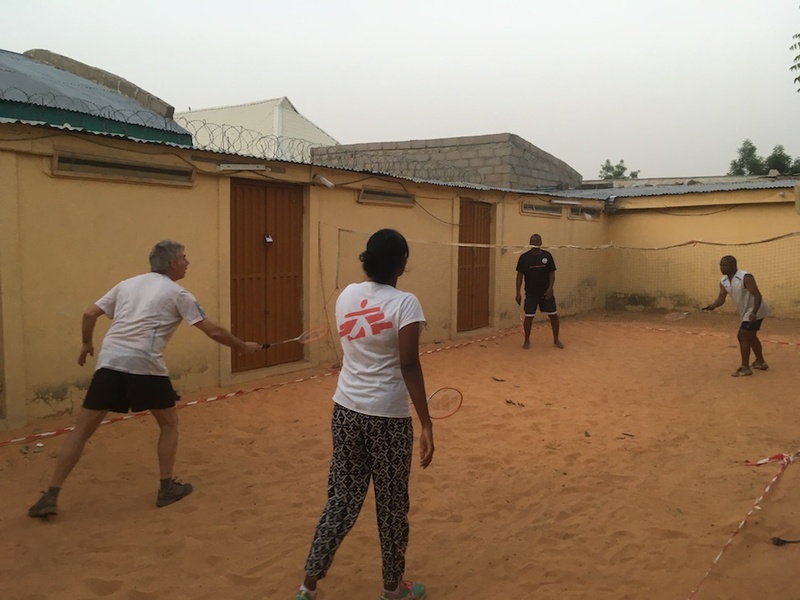 MSF is well established and appreciated by the townspeople. Smiles and greetings are daily occurrences. Today on my way to work two girls came to walk with me and held my hand. They spoke even less English than my few words of Hausa but smiled warmly as we walked giggling along the dusty dirt packed road. On my way home I passed by a man sitting comfortably under the shade of a tree singing along to the radio. He asked about my day and I returned the question. He was more than happy for me to snap a photo with him. Just beyond the compound walls our neighbours were slaughtering a goat. I slowed my pace to observe the ritual and they ushered me over. In Halal tradition, the neck of the goat had already been cut to allow the blood to drain. 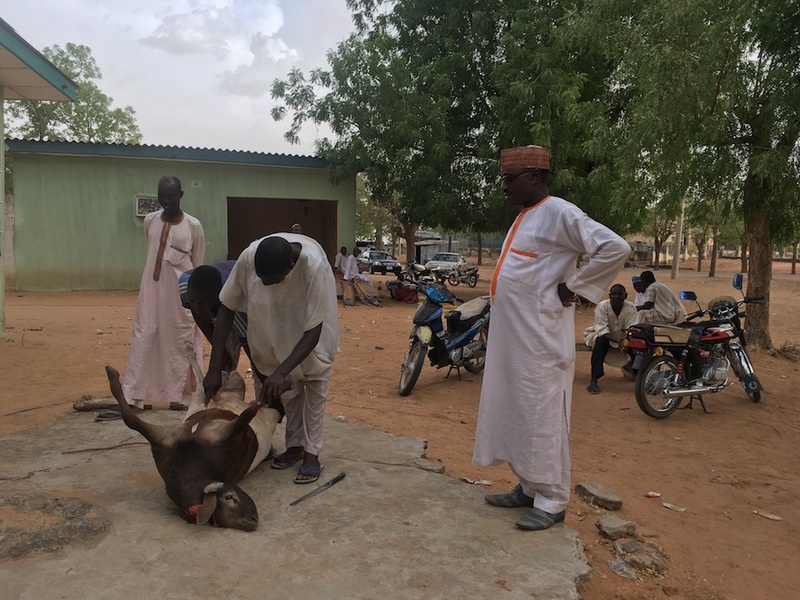 I watched as one of the boys, under the surveillance of the older men, cut the leg of the goat and blew into the potential space between the skin and underlying fascia. The goat swelled like a balloon. With a swift cut through the midline of the animal’s chest, they proceeded to remove the skin from along the perfectly planed incision. Impressive. The sun is setting as the BBQ is lit for our weekly feast. The temperature is cooler now with the evening breeze, a mere 36 degrees. A perfect time of day to hang out at the “beach” and play some badminton. After all, this is Jahun paradise.